Every time I order petite I have to send back for too long! These are petite and really like the elestatic waist! 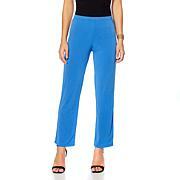 I have several Slinky tops (solids and prints), but this was my first purchase of the pants. The length and hip measurements fit me perfectly. I was happy to notice that a color in 1 of the print tops matches 1 of the pants perfectly.